A while back I posted a piece on Newark Airport's early days and its beautiful Depression-era art deco terminal and administration building, which was restored several years ago. What I didn't mention -- because I didn't know -- was that a key part of the terminal is no longer there. It's at the Newark Museum. I visited the terminal a few years ago to check out the architecture, and it didn't disappoint. No longer welcoming travelers as a gateway to their flights, the building now houses various law enforcement and public safety agencies, but I was able to walk freely through the lobby and upstairs balcony area. It had all the usual art deco accouterments, but I was stopped short by an abstract-looking mural on the second floor. It felt weirdly modern, though I couldn't place the era. The answer came in a booklet provided nearby, which explained that the mural was one of several sponsored by the Federal Art Project of the Works Progress Administration. 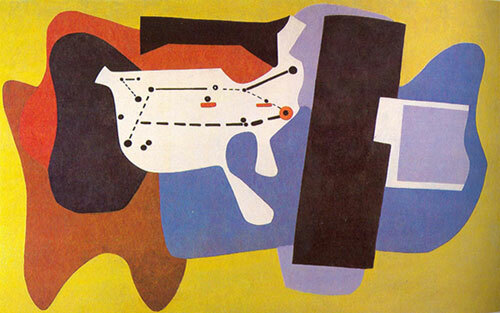 Armenian-American painter Arshile Gorky painted ten works for the building and called them "Aviation: Evolution of Forms under Aerodynamic Limitations." Instead of working directly on the plaster walls, Gorky painted on large canvases, a practice regularly used by WPA-sponsored artists. His works remained in view at the airport from their installation in 1937 until the War department took control of the airport in 1942. At that point, they disappeared. However, they weren't forgotten. In the 1970's, the Port Authority of New York and New Jersey, now operators of the airport, began an inventory of art in the agency's older buildings. While surveying Newark Airport's oldest building for its art deco detailing, a researcher happened to notice a thread dangling from one of the walls and surmised he may have discovered the missing murals. Eventually, through testing the fate of the Gorky works became clear: they'd been obscured by fourteen coats of mundane wall paint that had been slapped up over the years. Today, two panels of the ten survive and are now hanging on the first floor of the Newark Museum, their vibrant colors restored. I rediscovered them when Ivan and I visited the museum over the summer, and found that the one I'd seen at the airport was a reproduction. To be honest, I had mixed feelings about seeing them at the museum. On one hand, I was rather pleased that I could identify them and knew their provenance. On the other hand, I felt they should be at their original home, EWR circa 1935. There, they felt like a secret treasure only a few of us knew about.